Black or White? That's the name of this exclusive release from ARISARIS available at The Tolerance Fair -Tolerance is the Only Way. The dress is mesh with straps that cross i the back. The necklace and earringset is Maggie from GEWUNJO DESIGN available on Markeplace. Poses from OVATION. What gorgeous textures in new Lavanya Lehenga from GLITTERATI by SAPPHIRE. The outfit includes two skirt versions, silk and organza. The dupatta (shawl) also has two versions, shoulder and one that covers the head. You can see that my hair shows through the dupatta when viewed at some angles as it's sheer. It's really more lovely than my pics show. 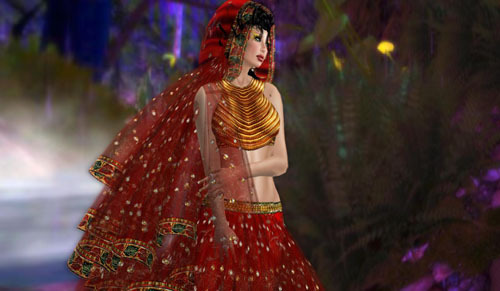 Lavanya Lehenga comes in red, copper, olive, jade and black. 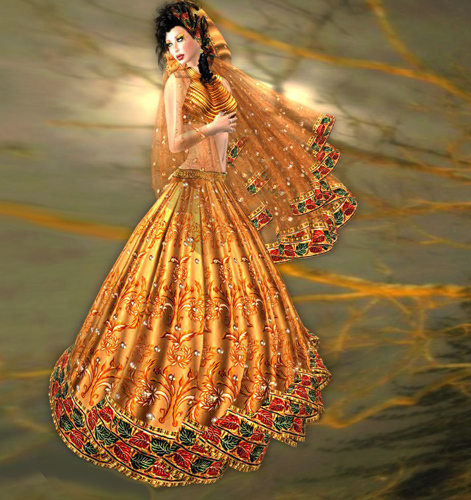 Check out Divinity Indian Lehenga while you're there. The LM should take you directly to both. Lisana has a leg baring cocktail skirt, a sculpted bustiere and a large bow int he back. Poses from OVATION, shoes from L+R+W, hair from Truth. I don't know about you, but I always have trouble finding lip layers that work with my skin, but these work perfectly! Not only that, Luscious Lips - High Gloss Color n' Maximizer from GLITTERATI by SAPPHIRE comes in two sizes and lip shapes. I found that both work for me. I'm wearing the small here. There are six lip shades and I love every one of them. Besides, who can resist colors with names like Breathless, First Kiss and Cherry Sorbet, to name a few. Demo available. Custom pose from OVATION. Don't you just love these new AMARELO MANGA separates? The gold embroidered back pocket and gold textures on the sassy cuffed shorts work perfectly with this new brown and gold corset top. The Carmen shorts and the Carmen corset are available in four colors. Poses from OVATION. Wherever I wear Claire from ENTRES MARES people stop me and want to know where I got this gown. They say it's gorgeous...and they're right. This red color with the gold trim is particularly stunning. 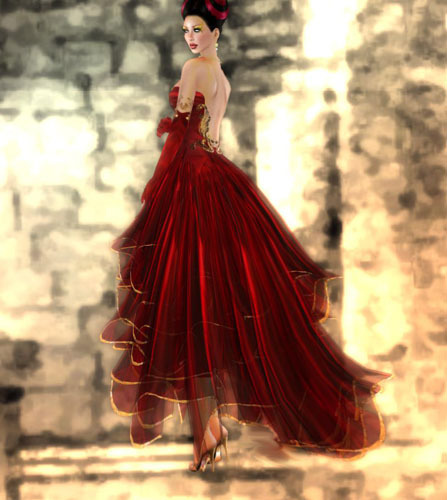 Even my husband likes the style and color of this gown and he's picky about what I wear. Do I listen to him? Most of the time, no... lol...but this time he's right :-) The ankle baring skirt has a beautiful sweep which I tried to show. Claire comes in several other colors: white, purple, copper and a lovely vibrant blue. 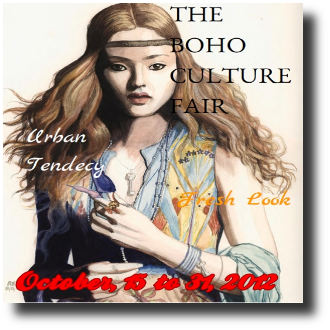 I thought I would tempt you with a sneak peek of what you'll be able to find from WOW SKINS at the upcoming Boho Culture Fair. This is the exclusive Isabella in the milk tone and the Isabella shape. Isabella also comes in a mid tine and deep tan. Each pack contains 6 makeup versions, with and without cleavage. Pose made by Halllie. Smash! from POISED is a four piece outfit consisting of a top, over blouse, mesh skirt, and yes the hair flower. This color is called Sparkle but Smash! also comes in Sinister and Royal. POISED actually specializes in urban wear and only sells on Marketplace. Hair - Sira with color change band new from AMACCI. 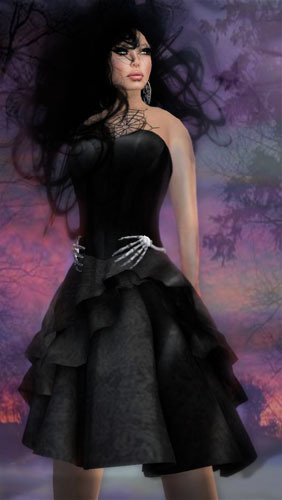 No trick, only a treat with this classy casual Halloween gift from SASCHA'S DESIGNS. The outfit consists of belted copper and burgundy print pants and solid burgundy top with an eye catching boat neck collar. The pose is from the OVATION Avery collection to be released later this week. Hair is an attachment with texture change band from AMACCI. The October group gift from SASCHA'S DESIGNS is this lovely gown in a light shade of turquoise, with sweeper skirt, subtle sequins at the hem and a flower attachment on the bodice. The flower attachment is actually not meant to cover the arms as in the first photo, but since it's modifiable I chose to make it larger and wear it over the arms. It's actually designed to fit close to the body as shown in the last pic. Jewelry is Christine from VIRTUAL IMPRESSIONS. You can see pics of the color change set here. The backdrop was created with Ovation's Studio Mirage. The poses are a preview of a new set from OVATION called Avery due out this week. Being Ruth-ed never looked so good! Ruth, a new jewelry set from VIRTUAL IMPRESSIONS is a hud controlled necklace and earring set. Unlike some, with one touch both necklace and earrings change to the color of your choice at once. No clicking the different pieces. There are 21 gemstone colors,6 metals and 2 crystal choices. The photos show just a few of the options. 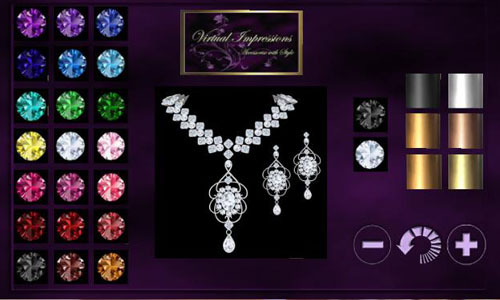 And in case you missed it, I posted another new Virtual Impressions jewelry set a few days ago. You can find that post here. Okay, so I don't look so sinister as the name of the dress implies. I tend to lean toward the feminine and cutesy side in everything I do. I'm a children's ministry director in RL so this is about as sinister as I get. 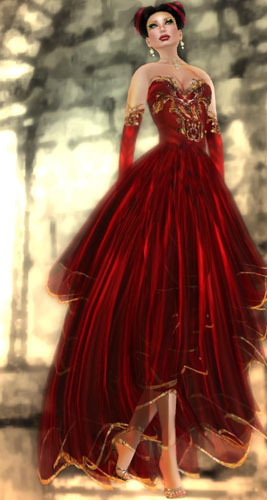 '-) Nevertheless, Lady Sinister from ARISARIS is a fun dress for the season and you can be as macabre as you wish. It comes with the skeleton belt and the two cobweb attachments on the shoulder and decollete. 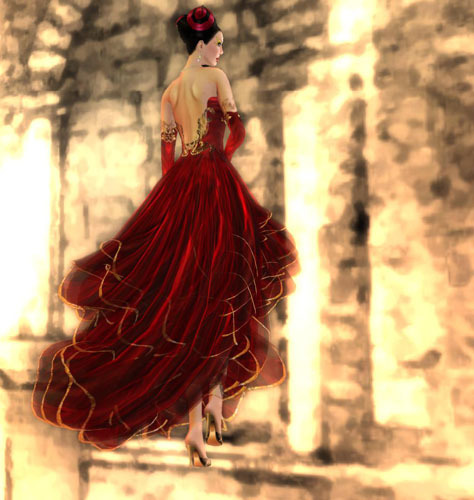 The dress is mesh with both top and lower skirts and you can see that you can wear just the top skirt if you prefer. 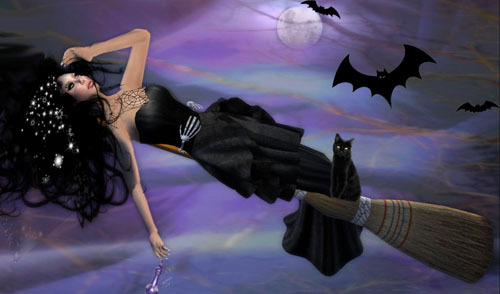 The broom is a freebie I've had for a while but the poses are ones I created myself. I've been shopping at Virtual Impressions for a long time and love it that some of the new creations are HUD controlled. This new jewelry set called Christine is one of them. With 21 gemstone colors, six metals and two crystal color choices you're certain to create the look you need. I could have played with this set all day but these are just a few examples of what you can create. I totally love this new set. Pose from Ovation.